I got up at 7:00am to find a glorious day outside. I got ready, and half an hour later I put my long-walk hat on my head and set off. There were seven Villages along the route of the Walk where you could register to start and pick up an Event Passport. The nearest Village to me was over at Pyrmont – but it was on the other side of the Pyrmont Bridge, and because the route was clockwise only I wouldn’t be able to register at Pyrmont Village, walk back and get my Passport stamped. So that meant I should instead start at Observatory Hill Village, down near the Sydney Harbour Bridge. That was a lengthy walk in itself…but as I mentioned in Part 1, after some thought that presented an opportunity beforehand. So I spent 30 minutes walking from home down to Circular Quay where I stopped at the City Extra restaurant and treated myself to a big breakfast of bacon, sausages, scrambled eggs and a jumbo Coke. An hour later, feeling pleasantly full, I spent another 15 minutes walking from City Extra and through The Rocks up to the top of Observatory Hill. As I arrived at that Village, a large crowd of Walkers also appeared from the Sydney Harbour Bridge – the bridge I was saving for last, as it was the most iconic. I registered, got my Passport and first Village stamp, and put some sugar-free gum in my mouth. At 9:28am, my Walk began. The first part of my Walk was a good way to start. For one thing, it was part of my favourite old trail that I’d been walking for years. For another thing, it was mostly flat with the rest of it downhill. With many others I headed into the northern CBD, turned west to Darling Harbour, followed part of the foreshore around to the eastern end of the Pyrmont Bridge, and crossed to the other end of the Bridge where I got my first Bridge stamp. About 10 minutes later, I arrived at Pyrmont Village and got my second Village stamp. Many of us continued westward along the Pyrmont foreshore. Although I have been to Pyrmont many times since the early 2000s, I hadn’t been to this part so there were new and interesting sights to see. About 20 minutes later, we came to the eastern end of the high-rising ANZAC Bridge. I smiled as I looked up and saw many other Walkers crossing it. Although the ANZAC Bridge is high, I had crossed it several times back in 2009 and it hadn’t given me grief like the Gladesville Bridge had back in January. Because of the ANZAC Bridge’s height, however, and the massive spiraling walkway at the eastern end, it took about 10 minutes just to get up there. To my surprise, that was where the ANZAC Bridge’s stamp point was, and so you got stamped before you crossed (because as I was about to learn, that was the only good spot for setting up the stamp point). But as for the ANZAC Bridge itself, it was another easy walk like the Pyrmont Bridge and despite its size it took barely 10 minutes to cross. Soon, many of us were over in Rozelle and making our way towards Rozelle Village. There was a Water Station with portable toilets in Easton Park, about halfway between the ANZAC Bridge and Rozelle Village. It looked like a good spot for my first break, and so I halted to relieve myself and have a drink. I had thought about staying there for at least 15 minutes and drinking some of my water, but then I surprised myself. First, I quickly drained my 1.5-litre water bottle. Second, I didn’t really feel like stopping. So not even 10 minutes later, I set off again. And about 15 minutes after that, after walking through cozy suburban streets and part of the Callan Park heritage site, I arrived at Rozelle Village and got my third Village stamp. So far, still very good. This time, I made more of an effort to take a break. I refilled my water bottle, rested against a fence and regarded the nearby Iron Cove Bridges. 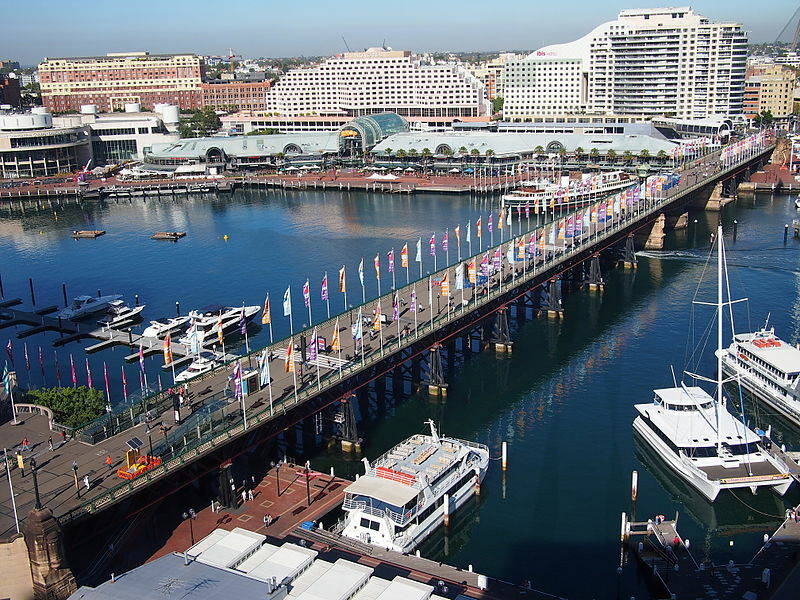 Like the Pyrmont Bridge, both bridges (the 1955 original and the 2011 duplicate) were enjoyably low and flat. I had walked across the 1955 original back in January after crossing the Gladesville Bridge. Today, I would be walking over the 2011 duplicate. And about 20 minutes away, beyond the hill of downtown Drummoyne, was the Gladesville Bridge. I couldn’t see the Gladesville Bridge from where I was, but I had been thinking about it on and off all morning. Would I be able to cross it again, calmly – or at all? I refilled my water bottle again and resumed my Walk. This entry was posted in Action, Happiness, Hope, Inspiration, Life Challenges, Travel. Bookmark the permalink.